I'm new to 3D printing and since I updated to Cura 4 I'm having trouble with a really annoying phenomenon happening on each and every one of my prints: when the nozzle goes between parts of a model that has gaps or holes, it prints a little tower right in the middle making my print ugly thus adding post-processing that could be avoided. Could someone please help me figure out what is going on? Hello @JujuLab, please save the project file (File -> Save) and attach the .3mf file to this thread. Thanks. Hi @smartavionics , please find the requested file attached, thanks a million for helping me out! Hi @JujuLab, thanks for the file. I can't explain the weird tower in the middle but the other dangly bits are probably because the model has bridges. You could try enabling the experimental option "Enable Bridge Settings" which will modify print speed, flow rate, etc. and that may improve the quality. 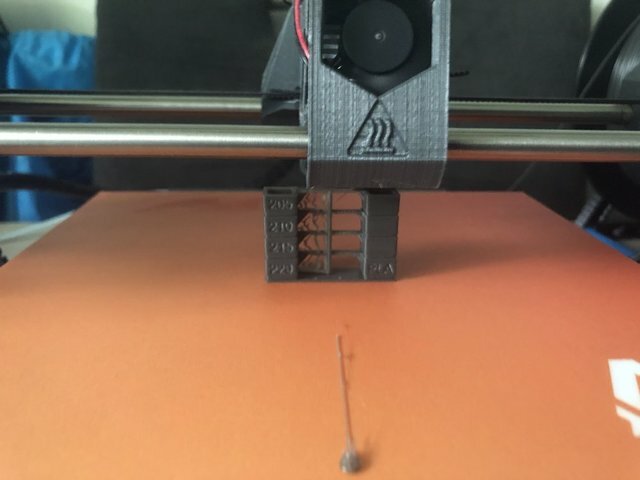 Thanks for your help anyway, I'm still trying to figure out why this is happening, printing retraction towers to test out what can be modified to get rid of the tower but I'm not having any luck so far. Ok folks, I figured out what the issue was, it came from Octoprint, I deleted my old install for a nice clean updated one and everything is back in order. I've no idea why this was happening, I might have tweaked some settings that I do not remember of but anyway, undesired tower is now gone!